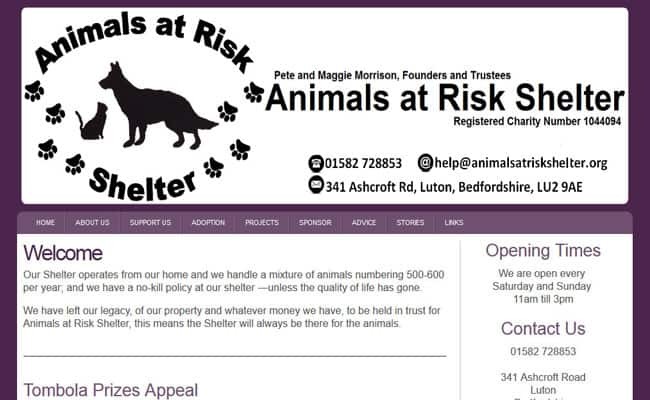 Animals at Risk Shelter, Luton – The Animals at Risk Shelter in Luton handles a wide range of animals, as many as 500-600 per year. The shelter has a no-kill policyfor all animals unless the quality of life has gone. Apart from the animals which are awaiting re-homing, the shelter holds around 40 to 50 residential infirm animals, mainly cats and dogs. These animals, unsuitable for re-homing due to age or health reasons, will live the rest of their days at the shelter. They live as part of our family at the Shelter. All cats available for adoption and over the age of 14 weeks will go to their new homes with a full health check, spayed or neutered and microchipped. Younger kittens will need to be spayed or neutered when they are old enough, please contact your vet for advice. We will try to provide as much information on our animals as possible, however we are not always able to provide full histories. All cats available for adoption and over the age of 14 weeks will go to their new homes with a full health check, spayed or neutered and microchipped. Younger kittens will need to be spayed or neutered when they are old enough, please contact your vet for advice. We will try to provide as much information on our animals as possible, however we are not always able to provide full histories.